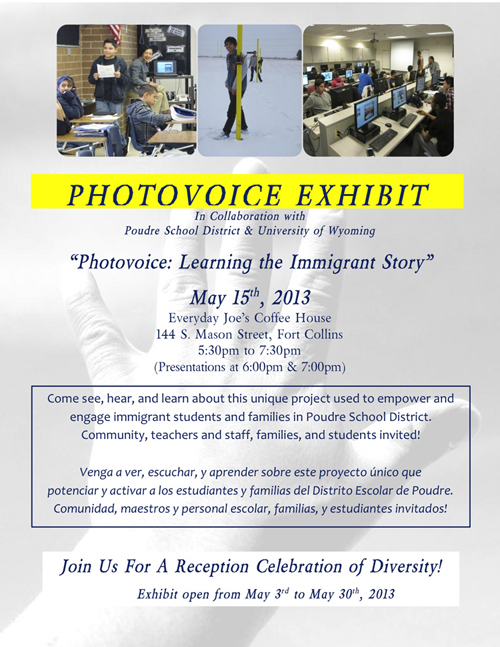 A community photo project, entitled "Photovoice: Learning the Immigrant Story," is on display at Everyday Joe's Coffee Shop, at 144 S. Mason Street (Old Town), in Ft. Collins throughout the month of May. A special reception is scheduled for May 15, from 5:30-7:30 p.m. Student and parent participants in the project, teachers and administrators from the Poudre Valley School District, and local community members will be present. In all, the team provided five different sets of workshops to different participant groups, each set of workshops lasting five to six weeks. More than 60 individuals participated in the project, with more than 100 of their posters (each 2 ft. by 3 ft.) hung on the walls of Everyday Joe’s, an old warehouse turned coffee shop. “Being a part of this project, with so many amazing and inspirational immigrant students, parents, teachers, paraprofessional and district level staff, has been quite an honor and an important educational experience for us,” Roxas says.